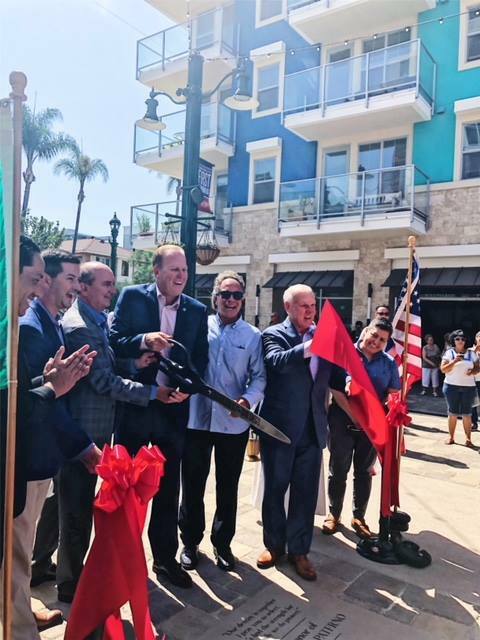 Our home, the piazza, was officially welcomed to San Diego's Little Italy neighborhood. It's official! Little Italy Food Hall is open and the Piazza della Famiglia was christened with a public ribbon cutting on August 2nd. Our food hall family not only enjoyed a front row seat to the festivities (the ribbon was literally feet from our door), but each of our stations sampled their goods to those in attendance. In front of friends, family and residents, Major Kevin Falkner, members of the Little Italy Association, and the HG Fenton team marked this great occasion with a ceremonial ribbon cutting. As LIA Chief Executive Administrator Marco Li Mandri put it, “The opening of the Piazza della Famiglia is significant not only to San Diego but around the country—it serves as a model for innovative community projects that want to create great public spaces. The Piazza della Famiglia enriches San Diego’s Little Italy, acting as a pioneer for other neighborhoods in the U.S. on how a community can activate its public spaces and improve its community by building a central gathering place. It’s especially unique to the U.S. because it reflects the European lifestyle of coming together in public spaces—to eat, drink, people watch, interact with friends and relax after shopping. It also invites residents, visitors and the community to engage with each other." Our LIFH family can't express how lucky we feel to be a part of the piazza and Little Italy. We hope to be the place you want to gather for a long, long, long time. For more on the Piazza della Famiglia ribbon cutting and dedication, check out this story from Channel 10!